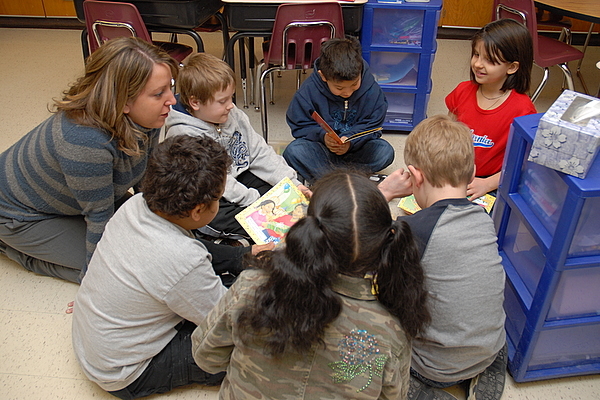 Photo: #A teacher talks with some of the students in her second grade class. St. Paul, Minn. — Today is the first day of class for most Minnesota school districts. As the year gets underway, districts are also trying to figure out how to use some unexpected federal money. Congress approved the funding this summer as a means to protect education jobs, but some districts aren't so sure they will add jobs this year. The funding totals $10 billion for education jobs in all states, and is meant to soften the blow that comes when the two-year federal stimulus funding runs out. Minnesota will get $167 million. The state has estimated how much each school district will receive. For instance, St. Paul schools will get $9 million; Minneapolis, about $8 million. Some charter schools will get less than $10,000. The stated goal is that the money be spent during the current school year. However, there's no actual requirement to do so. 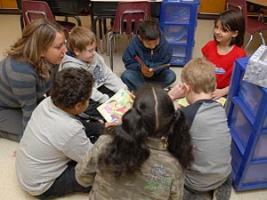 The law lets districts push the funding into the 2011-2012 school year. "This money would have been much more usable for this year had the federal law been passed three or four months ago." "I think the timing probably leads us somewhat towards trying to hold this money in reserve," Kyte said. "This money would have been much more usable for this year had the federal law been passed three or four months ago." The timing Kyte refers to is the timing of budget cycles for school districts in Minnesota. New fiscal years start every July 1, and districts must have their local budgets set by then. Meanwhile, contracts with union teachers and other workers require their own process for laying people off, which is why teacher layoffs for this new school year actually started happening this past spring. There was no guarantee at that time that Congress would approve the funding, so districts could not plan for it when they were crafting their new budgets. One survey estimated that all metro area districts have laid off a combined 1,200 people this year. So districts could hire back some of those people now, but that process has its own complications. The Robbinsdale school district will get about $2.2 million from the jobs bill. Spokesman Jeff Dehler says all the students heading to school today for their first day know which teachers they're going to have. "It would be difficult to add another section of third grade at this elementary school, because you'd end up having to shake up all the classrooms," said Dehler. "So classroom teachers would be difficult to do. But there are a lot of other opportunities that we could use the funds for that would be a great benefit for students." Dehler says one option is instructional coaches, who work in the classrooms and assist teachers with the day's work. He says Robbinsdale has used some of its past federal stimulus funding to pay for coaches, but there hasn't been a final decision made on how or when to spend this new money. There's a lot of flexibililty here, too. Schools must use this money to pay employees, but that includes everyone from teachers and librarians to bus drivers and custodians. One district that has made up its mind is the state's fourth-largest district, Rosemont-Apple Valley-Eagan. It will get about $5 million, which finance director Jeff Solomon says will be saved for next year. He says one reason is that as bad as all the cuts were this year, estimates for next year are even worse. "We're concerned about the yo-yo effect of bringing back positions this year, and then having to re-release them -- and then some in addition to that, next year," said Solomon. The Minnesota Education Department anticipates it will have the new federal money in hand in the next week or so, which means districts that do decide to use the money this year can start getting it from the state by the end of this month. How funky strong is your fight, anyway?